All orders will be processed and shipped in about 3 business days after your payment. Please email info@rehabps.com if you have questions about shipping methods and charges or if you want to order more than 10 pieces. Perfect help for all rehabilitation experts explaining the exercise position to the patients and comparing the patient’s postural-locomotion pattern to the optimal developmental patterns shown on the posters to determine a weak link (functionally decentrated segment) within the global postural-locomotion chain. Developmental positions starting at 3 months through13 months are demonstrated in both, an infant and an adult. 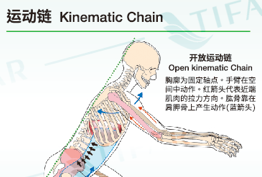 Posters also demonstrate basic principles of core stabilization, ipsilateral and contralateral locomotion patterns and open and closed kinetic chains. All developmental positions in one rollup banner. Rollup banner is delivered with bag and all necessary parts for easy installation. The DNS Corrections Poster is a new practitioner's tool depicting and simplifying optimal and abnormal stabilization strategies. Use this poster to both introduce the original concept of "Functional Joint Centration" versus "Decentration", while clarifying stabilization strategies to your clients. Save time demonstrating the most common imbalances in human erect posture, optimal and faulty coordination among muscles stabilizing the chest, spine and pelvis. 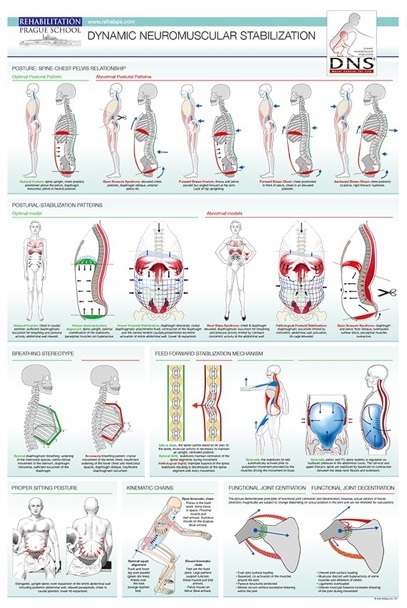 The new poster quickly demonstrates how ideal and faulty breathing stereotypes differ, while also showing proper sitting and squatting postures. The new "DNS Corrections Posture" is artistically designed to be a professional and aesthetic educational tool to any clinic or gym.